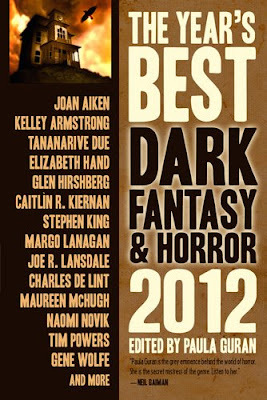 I’ve posted recently the table of contents of the upcoming yearly anthology, “The Year’s Best Dark Fantasy & Horror 2012”. I come again to Paula Guran’s anthology for its cover artwork and a small amendment. It is very good to see that Prime Books follows the same line of the previous collections of this yearly anthology and although the actual artwork of the cover is quite small it still sets the mood for “The Year’s Best Dark Fantasy & Horror”. The small amendment is that the table of contents features one more story, Stephen King’s “The Dune”, that appeared in Granta, issue 117. As much as I am struggling to be objective for this post I am afraid that my subjectivism on the matter runs really deep. I have to warn you that I love Barcelona, and not only for one of its football teams, but because it charmed me even from my first visit there and I love Carlos Ruiz Zafón’s novels a lot. That is why I was mesmerized by this book trailer before I started watching it. All right, it is a bit untrue since I am not that subjective. However, I do love how the archive photos are put together in recreating something of the Barcelona of the 50s, the time in which “The Prisoner of Heaven” takes place, and inflicting it to the readers. The black and white photos have a magical touch, because not always everything is about color. I said a while back that I would love my Spanish to be as good as I dream to be, because I would love to read the new Carlos Ruiz Zafón’s novel in its original language. For the time being I am not confident enough that I will manage such a task, but I would still love to have a copy of “El Prisionero del Cielo” (The Prisoner of Heaven) in Spanish. Unfortunately, this desire has to wait just a bit longer as well, since I do have to put some money aside first. But enough with the laments. The book trailer looks wonderful, yet another reason for “The Prisoner of Heaven” to be high on my wish list for 2012. And I say 2012, because Carlos Ruiz Zafón’s “The Prisoner of Heaven” will be released in the UK, by Orion Books, on 21st of June. I will not bore you again with my dislike of characters on the book covers. Actually it is not so much a dislike, but something that I am not very much attracted to. The balance is inclined towards the opposite scale after opening the book covers, however. Strong and clearly defined characters are among the main factors that make me enjoy a story more. Today I will not talk about Daniel Polansky’s debut novel, because, unfortunately, caught in the time whirlpool last year I didn’t get the chance to pass over the book cover. Instead I will talk about that cover or more exactly covers. Daniel Polansky’s novel had two different covers for its UK and US editions, but also two different titles. “The Straight Razor Cure” in the UK featured a character on the cover, not clearly defined, but with the customary hood of the many fantasy book covers of late. Instead “Low Town” in the US had a far more simple cover, more concentrated on letters and design. 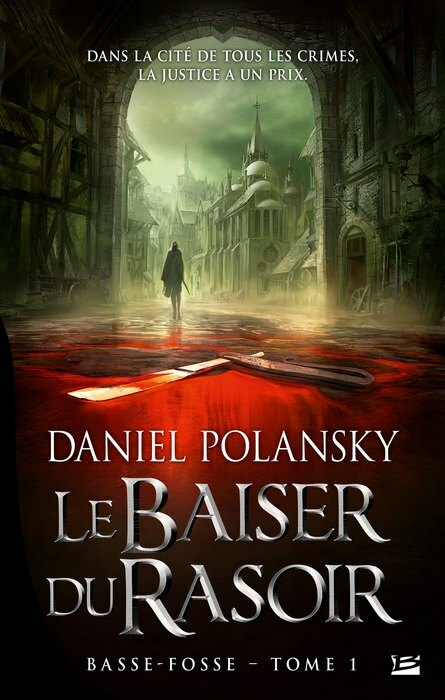 It is true that I may not have managed to open Daniel Polansky’s novel, but I ventured outside the English language market and discovered a cover very much on my liking. And where else could such a cover be if not in France? The Bragelonne edition of “The Straight Razor Cure” or “Low Town”, “Le Baiser du Rasoir” (which is translated as “The Kiss of Razor” I believe, so we have a third title) is a beauty focused on scene and atmosphere, with lovely details of the buildings seen and attractive colors. I also love that the razor actually splits the cover in two plans, but without breaking and with the best effect on the overall picture. The author of the best cover I’ve seen so far for Daniel Polansky’s novel is Fred Augis, a French artist born in Lyon, currently living in Paris and whose other works can be seen at Between Dog and Wolf website. Stephen Jones’ “The Mammoth Book of Best New Horror” and Ellen Datlow’s “The Best Horror of the Year”, “The Year’s Best Fantasy and Horror” before that, are the two yearly anthologies that will find a home in my personal library as long as they would be published. Recently, another such anthology sneaked its way in, Paula Guran’s “The Year’s Best Dark Fantasy & Horror”, because both 2010 and 2011 editions proved to be very good and truly rewarding. 2012 will not differ much in this case, I am eagerly waiting for all these three collections of stories to be published so I can bring one copy of each into my humble collection of such anthologies (I wish I had all of them, but it is not the case at the moment). Two of these anthologies, Ellen Datlow’s “The Best Horror of the Year 4” and Paula Guran’s “The Year’s Best Dark Fantasy & Horror 2012” announced their final line-ups this month, on Ellen Datlow’s blog and Prime Books’ website respectively. Both feature authors I am familiar with and I am looking forward to read and writers that unknown to me but who I am very curious to meet through their fiction. Here are the two tables of contents with the specification that I am waiting for the cover artworks of these two anthologies since the previous years proved to be excellent in this aspect as well. I have many soft spots when it comes to my readings and one of the major ones is post-apocalyptic literature. It is one of a few genres or sub-genres that I devour with every occasion I get. And one of the constant sources of nourishment when it comes to post-apocalyptic fiction is Abaddon Books’ series of novels in the Afterblight Chronicles. One of the titles that I enjoyed, although for different reasons than the heavy pieces of this sub-genre, is Scott Andrews’ “School’s Out”. Despite that I didn’t get the chance to read the next two Scott Andrews’ contributions in the Afterblight Chronicles, “Operation Motherland” and “Children’s Crusade”, “School’s Out” still lingers in the back of my mind. 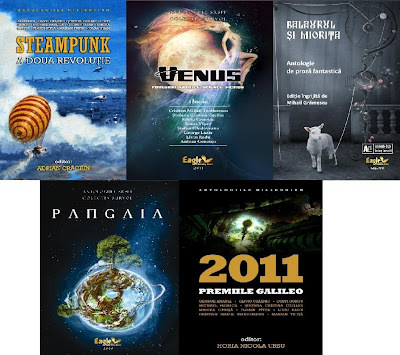 Well, I will have the chance soon to catch up with these novels, because Abaddon Books will release and omnibus edition of Scott Andrews’ works on September 2012. 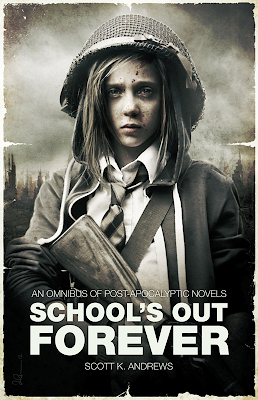 As I said “School’s Out” wasn’t exactly a match for other post-apocalyptic novels and short stories I read, but I admit once again that I enjoyed it and given the chance I will read it one more time with pleasure. This is the main reason for my interest in the upcoming omnibus, “School’s Out Forever”. Another such reason, well, is this amazing cover. I fell in love with it the instant I saw it. It fits Scott Andrews’ work like a glove. The minimal color scheme, the props and background work perfectly for me and I am convinced that this omnibus couldn’t have had a better cover. Responsible for this beauty is Luke Preece, an artist who works for Rebellion Developments and who is found guilty of creating other very interesting covers for Abaddon Books and Solaris Books. Still, I found the cover for Scott Andrews’ “School’s Out Forever” to be Luke Preece’s best so far and it gives me another reason for picking this omnibus up and enjoying it while listening to one of my absolute favorite singers, Alice Cooper, with the song that immediately comes to mind right now and entitled, how else, “School’s Out”. The Galileo Awards also have a Special Award for the Entire Career which will be announced together with these categories. The final lists of nominees will be available in February and the winners will be announced on the second half of March. I am certain that in 2012 I will buy more books than I can read, as it is always the same each year actually. But the first acquisition of this year is Alison Littlewood’s debut novel, “A Cold Season”. I am familiar with Alison Littlewood’s short fiction, mostly those published in the excellent Black Static. Although my first encountering with her fiction wasn’t something memorable, “The Empty Spaces” in Black Static 16, the next two shifted the scales of the balance, “Black Feathers” in Black Static 22 and “About the Dark” in Black Static 25. Therefore I had no hesitations when I placed “A Cold Season” in my shopping basket. As was the case last year with another title that sits firmly on my wish list for 2012, Simon Bestwick’s “The Faceless”, Alison Littlewood’s debut novel “A Cold Season” benefits from the many talents of Mark West who created its book trailer. And once again we have an atmospheric and haunting trailer, appropriate for the idea that I formed about “A Cold Season” so far. Of course, that until I will read Alison Littlewood’s novel. But first I have to keep a close eye on the postman. 2011 was a very good year. It is true that my schedule changed completely, but this fact doesn’t take away anything from a year that proved to be rewarding in many ways. Therefore, no complaints whatsoever about 2011. But since always there is room for improvement why not hope for a better 2012. Although I can’t imagine it would turn out to be a better year since we can’t look further than 21st of December ;) In the last years I set a few reading goals that in the end turned into thin air. I was thinking of some reading goals for 2012, but with the scheduled end of the world and my last failures of reaching these goals I will not set anything in the prospect. Except one thing. Last year I truly rediscovered the pleasure of short fiction. And since those were some of the most rewarding reading moments of 2011 I will set a goal for 2012 in the end: to read 366 short stories. I managed to keep the rhythm of one short story per day so far, so I am on track with my goal. I will also keep a list of the short stories I read and I will post it at the end of the year with a top of those I liked the most. At the end of last year I didn’t manage to post very often, but this year I will try to return to the usual schedule. I have some ideas for the blog and I hope that they will turn into something real. I know that I am indebted with plenty of reviews from last year. 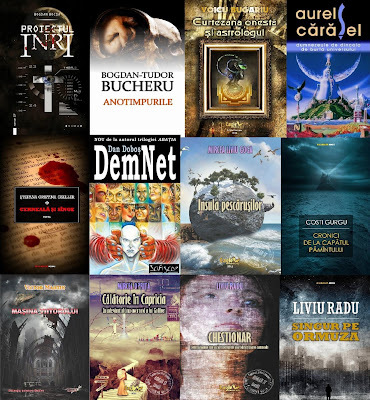 After thinking about this situation I have to admit that I will not be able to write full length reviews for these books, some of them wonderful readings. But I will try to catch up with them in form of a few mini-reviews and present some of the impressions these books made on me. Besides these, let’s hope that 2012 will be a wonderful year for all. And I hope that 2012 will bring you only joyful moments.